Dominaria was the first set to be designed using all the stages of the new process for design that Mark Rosewater outlined here. Ethan Fleischer headed up exploratory design, then Mark Rosewater led vision design with an experienced team, of which we were lucky enough to have Richard Garfield as a member. From there, set design was handed off to Erik Lauer. The last time Erik followed up on lead after Mark and Richard worked on a set together was original Innistrad. That felt like an exciting place to be starting from. As it turns out, Erik only led set design for about two months. Erik did a lot of work in that time to get the set initially balanced, so we could correctly assess what was working and what was fun. He established much of the initial structure of the set, such as color pairs and their themes and playstyles. As part of this, he incorporated Thallids into the set as something for black-green. He looked at how different color pairs would utilize historic in different ways and how white-black might be most focused on legends. He helped determine how abundant each mechanic would be in each color. Erik also helped find many exciting reprints in which experienced players would be able to find nostalgia and new players would find something adorable. At some point, Erik felt that he had created a rough draft of the set in an effective enough way for someone else to decide what to preserve and what could be changed or improved upon. At that point, we were excited for him to try to do similar work on the next fall set, code named Spaghetti. And that's where I enter. I must say that it was quite an honor to be working as the set lead for this set. There were numerous reasons to be super excited about this set: it's part of Magic's 25th Anniversary, I would be following up on the work of such a strong cast of designers, this was Magic returning home to Dominaria, and this would bring in many new and returning players near the launch of our newest digital offering, Magic: The Gathering Arena. Fortunately, as you might expect, there were many others in R&D who were similarly pumped to make this set as beloved as Dominaria itself. There were different people involved in the design of the set at various stages. For the set design meetings themselves and the process I'll be talking about in this article, I'd like to specifically thank all the following people, a rotating crew of the final Set Design team: Erik Lauer, Alli Medwin, Andrew Brown, Doug Beyer, Ethan Fleischer, Kelly Digges, Ken Nagle, Peter Lee, Ryan Spain, and Sam Stoddard. And now let's jump into some of my biggest fingerprints on what Dominaria was to become. The one thing I dialed up most with the set was without a doubt the presence of the supertype legendary. I've always been a sucker for legends. The Legends set drew me much further into Magic as a game with many intriguing and exciting characters. For years, I played cards like Sol'kanar the Swamp King and Rasputin Dreamweaver protected by my Karakas in my Type 1 decks in big tournaments, even though in reality that might not have been the most effective thing to be doing. Whenever someone in R&D laments that being legendary is just a downside, I'm always quick to argue that they enable new designs, that they can be stronger than they otherwise would be because of that drawback, and, importantly, that we can reference "legendary" on other cards to make them that much more awesome. While Champions of Kamigawa also played around with legendary as a major theme, it still felt like there was a lot more to be done and improved upon from what those earlier sets were offering. At some point, Ethan Fleischer suggested that he wanted to include one legendary creature per pack in the set code named Salad. I was very intrigued. Later, Salad became a core set and that idea didn't make as much sense there, so I was quick to latch on to that idea for Dominaria. To me, this wasn't some sort of gimmick but instead a nice way to make sure each pack offered something that the set was highlighting. We've done similar things for past sets, like with double-faced cards in Innistrad. This felt like a great way to create an array of diverse characters, inspiring your imagination to run wild. It also seemed like an easy way to make Commander players smile. The set certainly cared about legends before I touched it. 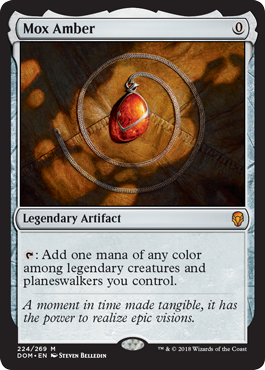 The historic mechanic cared about them, and as I noted earlier, Erik had suggested that the white-black color pair within the set specifically care about legends. One major concern was that it would be much easier to use artifacts to trigger historic than it would be to use legends to do so. Legendary cards specifically felt like they needed some more love here. As a result, we started making more cards that cared about targeting legends or controlling legends. Erik had already included some cards like Arvad the Cursed. We added some commons that cared about legends. It was in exploring this space that I came up with Mox Amber. Cast Down is a card that I've included in the file for many of my most recent sets, but it only finally stuck here. There are several other ways we found to make legendary cards more impressive, some of which you've likely already seen. These legendary sorceries all capture an extraordinary moment. In the case of Urza's Ruinous Blast, we see Urza detonating the Golgothian Sylex, unleashing tremendous destruction, ending the Brothers' War (also known as the Antiquities War), and becoming a Planeswalker in the process. This blast then plunged the plane into a global ice age. 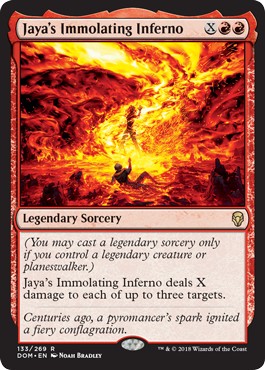 Similarly, Jaya's Immolating Inferno shows the moment when Jodah frees Jaya's mind from Mairsil, igniting her Planeswalker spark in a tremendous conflagration. There are six rare legendary sorceries in the set. You need to control a legendary creature or planeswalker to cast each one. Once you begin to cast the spell, it doesn't matter if your opponent kills your only legendary creature or planeswalker in response. Other than this, there aren't additional rules for what legendary means on these sorceries. You can play up to four copies in your deck, cast multiples of them in a game, and so on. There are many reasons that it matters that these spells are legendary. For example, they work very well with cards that reference historic. 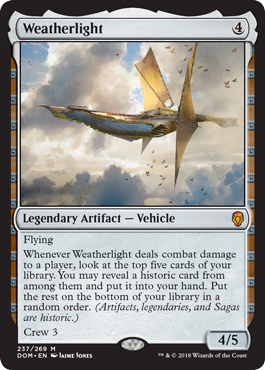 Board the Weatherlight can help you dig through your library to find these cards. Raff Capashen, Ship's Mage would enable you to instantaneously cast one of these legendary sorceries. If you build a deck with all (or nearly all) legendary permanents and run into an opponent who is playing a lot of permanents but not legendary ones, Urza's Ruinous Blast is about the most amazing card you could ever include in your deck. 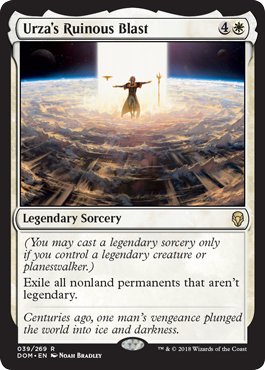 That said, it's hard to guess how much Urza's Ruinous Blast will ultimately see play since you can't count on your opponent not also opting to play enough legendaries of their own to mitigate the impact of this card. That could relegate it to certain metagames or as more of a sideboard card. The mere threat of this card could profoundly affect how people play and build sideboards. It notably doesn't help you deal with Hazoret the Fervent and The Scarab God, but it is a solid answer to almost every other one of the most played creatures in Standard—including pesky ones that are resilient to a normal death, since you are exiling them. 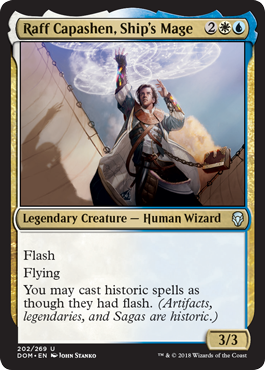 Earthshaker Khenra, Glorybringer, Rekindling Phoenix, Jadelight Ranger, Champion of Wits, Scrapheap Scrounger, Gearhulks, etc. 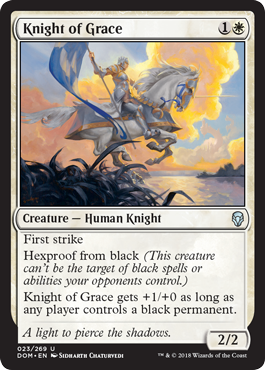 And don't forget that it's also great against many other noncreature cards like Aethersphere Harvester, Ixalan's Binding, Cast Out, Anointed Procession, and God-Pharaoh's Gift. 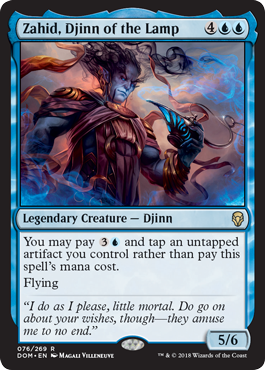 For those of you skeptical about this preview card at five mana, have I mentioned that Baral, Chief of Compliance is good with this and other legendary sorceries? It's time to give your legends a second look. The Sagas in this set were a lot of fun to make. The general implementation for these was mostly worked out before I touched the set. 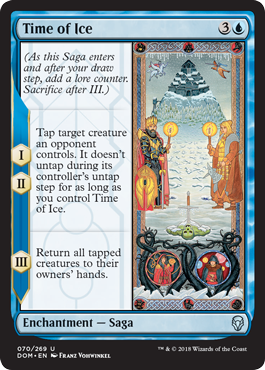 Erik had eliminated Sagas from common and eliminated an option to use mana to advance the Sagas. Mechanically speaking, I then reached a number of significant conclusions about these Sagas. Credit for the designs, names, and appearance of these cards all goes to others; I just tried to pick the best ideas. Many people helped with card designs. I give huge props to James Arnold for the frames, to Mark Winters for the art direction, to Kelly Digges for the creative direction on the concepts and names, and to Glenn Jones on the editing and wording. The same could be said of these individuals for other aspects of the set, and many other people as well. These cards are particularly illustrative of solving some novel challenges. The first change I made to Sagas was observing other employees reading and playing cards. They responded much better to Sagas with fewer "chapters," as we called them. When I took over the card set, the Sagas varied in length, and players just didn't want to have to wait too long for the payoff of the card and associated story. Ultimately, we felt it was best that these consistently contain only three "chapters." At handoff to me, Sagas had a combination of triggers and static abilities. In my mind, this led to some unnecessary confusion and sadness as you left a static ability chapter. I prioritized having all these only create an effect when they advanced to the next chapter. Another change was the decision to have the Sagas use counters for tracking. The hope is that these allow some fun interactions that otherwise wouldn't exist with cards that reference counters. I guess we'll see. Initially, Sagas were legendary themselves. We found, though, that these designs lent themselves to doing fun things when the same story was overlapping with another copy of itself. History of Benalia is one such example where you'd want to try to play more copies on subsequent turns. While we changed the Sagas to not be legendary themselves, we knew we still wanted them to be in the group of cards defined as historic. In many ways, adding this third item to the call-out for historic helped to unify what these cards had in common. This addition highlighted three pillars of emphasis during design for Dominaria's deep history as a gathering of weapons (artifacts), heroes (legends), and stories (Sagas). I'll be surprised if Mark Rosewater doesn't write extensively about the historic mechanic. He personally helped a lot through later stages of the design process in making sure we had top-down designs and diverse ways of exploring this mechanic. Most of our initial designs were cast-trigger rewards for historic cards, like Jhoira, Weatherlight Captain, that would most incentivize playing small artifacts, so we spent a lot of time also exploring historic designs that would synergize with higher-converted-mana-cost cards. It is worth noting that historic was the tipping point for us to introduce a new frame for legends. This is a change we might have made anyway at some point just to highlight legends. Given the focus of this set and wanting it to be as clear as possible when someone was playing a historic card, we felt like the time was right. Aaron Forsythe was a big proponent of this change (as well as various other rules changes you've seen already), and we felt confident that planeswalkers and Sagas already had frames that stood out, so we didn't modify them as well. Again, thanks to James Arnold for his hard work on many iterations of these legendary frames. I started playing Magic in the spring of 1994. Almost all my professional gaming accomplishments came using formats that highlighted the plane of Dominaria. As a result, I have many strong memories of and associations with cards set there. Many of the earliest Magic sets were filled with cards designed top-down to show resonant fantasy tropes. We wanted to play in the space again as much as we reasonably could. For anyone who'd played through the early years of Magic, we wanted to find some memorable cards to reprint that you might not have seen for a while. I placed a high priority on having reprints be fun, thematic, or otherwise notable and stayed away from some often-reprinted cards players might have seen over and over in various sets. In short, I wanted each reprint to be notable. I also wanted to make these cards be evocative of Dominaria. 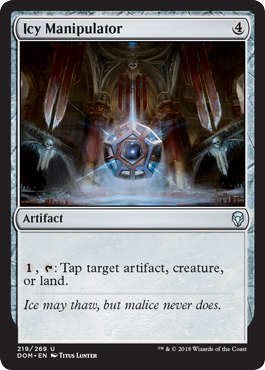 We didn't want to choose reprints that we felt created bad play patterns; Icy Manipulator is one example in a gray area that I personally fought for, given how iconic the card was in its day. I tried to keep as many reprints as possible from sets previously on Dominaria, although we ended up with a few exceptions: one cycle of cards, one card that felt at home here, and one card I wanted here with a set mechanic that we gave a new name. Two of the reprints I was most pleased to personally discover in searches and add to the set were Goblin Warchief and an innocuous common white creature that fit both thematically and mechanically. We also tried a bunch of reprints that didn't quite end up playing out the way we wanted. Some were too strong, some were too weak, and others we felt would just play better with some tweaks. Some other cards were new designs that simply fell close to old cards, and we tended to play up similarities to the past such that they would be callbacks to some other old favorites. Many new cards were very intentionally designed to be callbacks. Most of the earliest decks I played in my first months of Magic were monocolor decks. I fondly remember my red deck with Lightning Bolts and Dragon Whelps. Similarly, I remember my black deck with Nightmare as the finisher. It was a long time before I grew tired of those decks. My team helped me design a cycle of cards that would appropriately reward players who just wanted to play monocolor decks. We ended up with a creature for each color that cost three mana of their respective color. 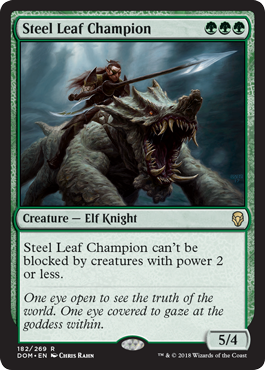 Steel Leaf Champion and Goblin Chainwhirler, in addition to a few others, are a couple of nods toward monocolor decks in the set. There's a lot of hype for this set, and it's not possible to deliver on all the hopes and dreams I've heard and seen from our fans. I am encouraged to see all the passion building up for this set from our fans even as I write this, two months before the set's release. I am very happy with what we've accomplished here with Dominaria. I hope you'll appreciate the passion that's been poured into it.